Did you have a fire in your home? Clear The Air works wonders to eliminate fire smoke odor. If you have unfortunately experienced a fire in your home, you may smell the remaining fire smoke odor. Hang 1-2 bags in each room with odors. One bag cover up to 100 square feet. Bag will continue to eliminate new odors for up to 3 months. In addition to the bags sprinkle Clear The Air Odor Eliminator for Concrete or Carpet and Furniture granules on floor and furniture, leave down 24 hours and sweep or vacuum. Odors will be completely eliminated. One canister of Clear The Air Odor Eliminator For Concrete or Carpet and Furniture granules covers approximately 100 square feet. One Clear The Air Bucket of granules covers 900 square feet. Clear The Air can also be sprinkled outside on concrete, decks, lawns and shrubbery to remove musty odors. It is not necessary to remove from lawns and shrubbery as Clear The Air will act as a natural time release nitrogen fertilizer. How to avoid a home fire. Clear The Air knows the dangers of a home fire and the horrible aftermath it leaves behind. Our product works wonders for eliminating any smoke odor from your home. Please contact us if you need help eliminating smoke odors from your home. Smoke Alarms – Install them if you have none, and check the ones you do have. Press the test button once a month and change batteries every year. Smoke alarms older than 10 years are more likely to fail. Carbon Monoxide (CO) Alarms – Equally as important as smoke alarms is having a unit that will alert you of high levels of carbon monoxide in the home. Check the unit’s packaging and also with your local fire department to learn more about what constitutes a hazardous CO reading. Heating Equipment – Heating equipment is a leading factor in home fires during winter months. Be sure to have furnaces serviced by a reputable inspector, cleaned and maintained each fall before cold weather sets in. When operating portable or fixed space heaters, be conscious to keep them away from items that could ignite, including drapes and articles of clothing. Personal Habits – Be conscious of where you are when you do the things you do. Smoking is the leading cause of fire deaths, sending bedding, trash and furniture up in flames. 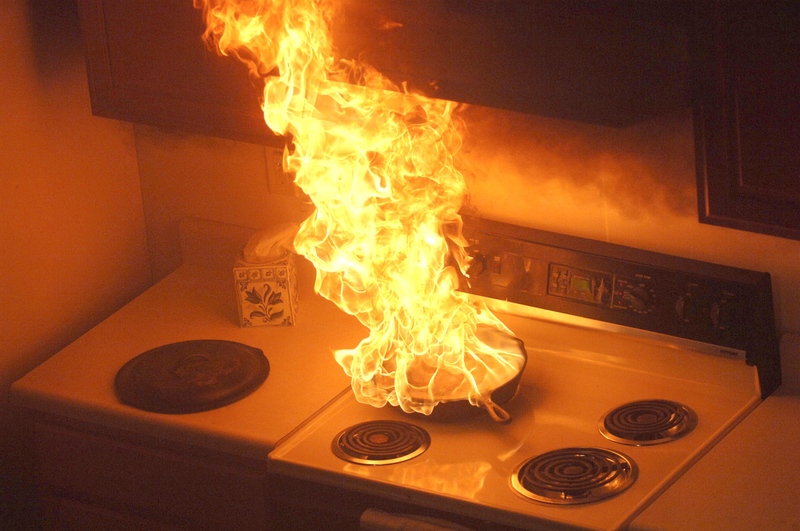 More fires start in the kitchen than any other place in the home, so keep a watchful eye on what you’re cooking. Flammables – Ensure that flammables, such as gasoline, kerosene and paints, are kept in proper containers, tightly sealed and stored away from heat and flame. Never store any of those items near a furnace or hot water heater, and be sure to follow manufacturer instructions on storing these types of products. Extinguishers – Many small home fires can be taken care of using a fire extinguisher before they get out of hand. One thing to remember, though, is that extinguishers do not last forever – plan on replacing the unit about every three years. Candles – Blow out your candles when you leave a room and never leave them burning if you leave the house.